Little Bit Funky: feeling brave. While perusing one of my favorite places...etsy...I stumbled upon Cutting Edge Stencils. I was immediately smitten by their enormous selection of HUGE, funky, stencils. 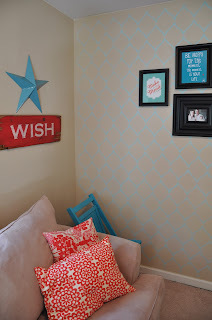 I don't know about you...but when I think of stencils I usually think "country"...or 90's for some reason. Not the case in the selection of this Etsy shop. I asked Doug what he thought when he got home...to which he responded "You've already decided haven't you?". 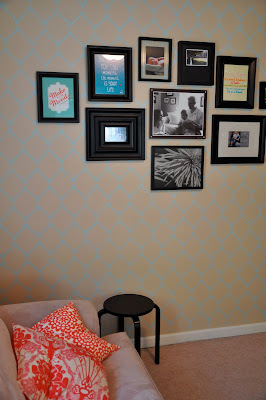 Then it was time to be brave...to trust the vision I had in my head for wall awesomeness. I turned on Netflix...and about an hour later I fell in love with a wall. Allow me to be a commercial for a moment...only because I LOVED the stencil...it was sturdy...and since I got a little level with my stencil it was EASY. 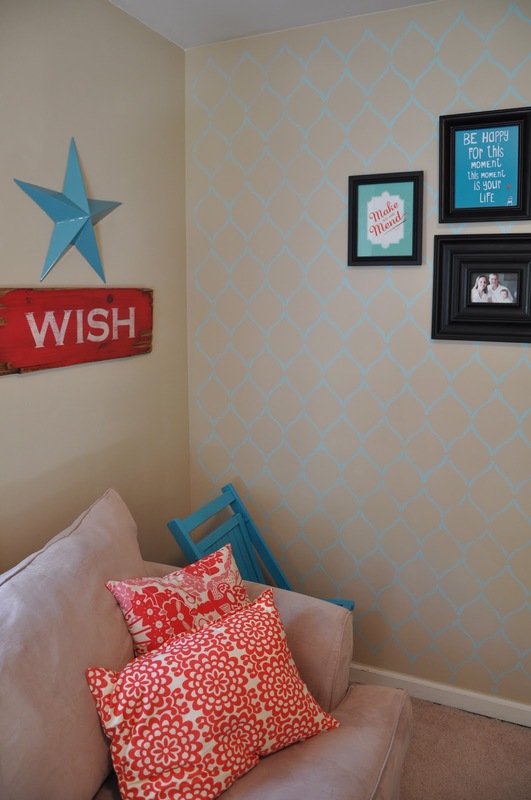 Their directions were easy to understand and follow, even if you have never stenciled. The edges were sharp and clear. And cleaning the stencil-the part I dreaded the most- was as easy as running it under water. Stunning...if I do say so myself. It makes the whole room cozy and warm and beautiful. For the color I used some of the "Crystal Aqua" (from Valspar-cause I know I will get asked) to tie it all together. :) I only did the one wall for now...but I am tempted to keep going around. Your bravery definitely paid off! It is beautiful! Crystal...it looks awesome! I have those bumpy textured walls though...i wonder if it would still work??? That looks great! I am so intimidated by stencils but want to spruce up an accent wall with one soo bad. that is rad!!! you did a phenomenal job! your work transformed it into a cozy little study that i want to sit in a sip a cup of tea while watching you've got mail. great job crystal!! so great! Wow. Gorgeous. I LOVE love it. Definitely being brave paid off. I love the new wall...You did a great job! Amazing. I can't even imagine having the patience and skill to do this. It looks great! That's really gorgeous!! 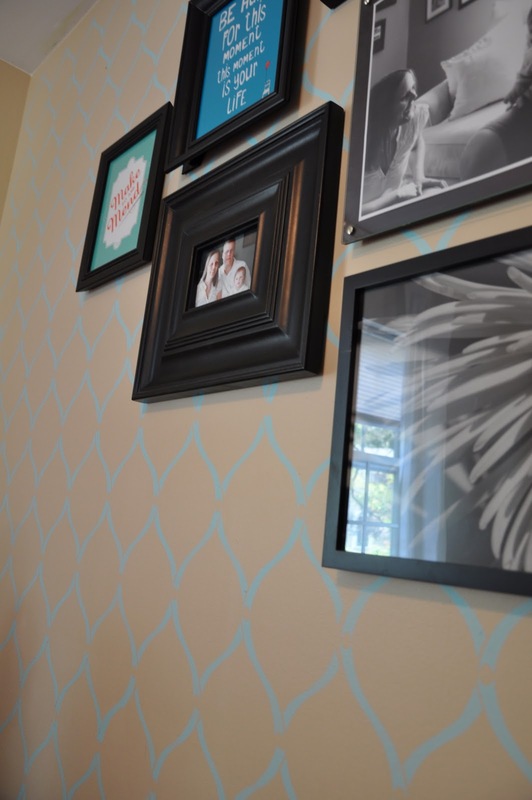 A great way to get the wallpaper look without the hassle of actual wallpaper. And I love that you decorate your house so bright and cheery! That gives me a great idea for my guest room that's in desperate need of paint. Thanks! This is gorgeous!! I am so jealous of your cheery little space.